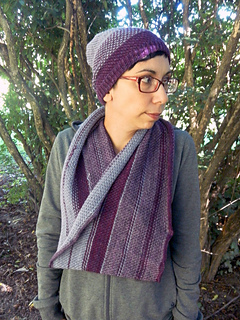 Kits available online on Snail Yarn Etsy shop. 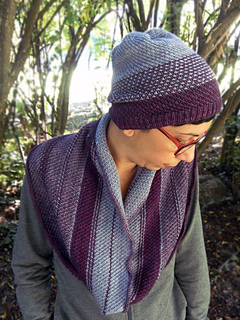 Stripes & Blocks is a quick loop cowl seamlessly worked in the round from the bottom up. The loop consists in six colour blocks interrupted by random stripes with endless possible combinations! 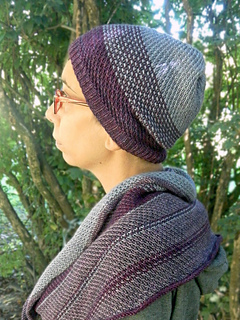 It can be worn doubled as a cowl or as a loose loop around the neck. Finished measurements 39 inches/100cm around, 10 inches/25 cm tall. 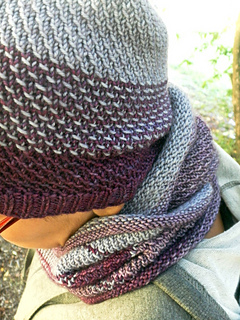 Snail Yarn Merino Sport (100% superwash merino; 328 yards/300m per 100 grams); Colours A, B and C: 1 skein each. Approx. 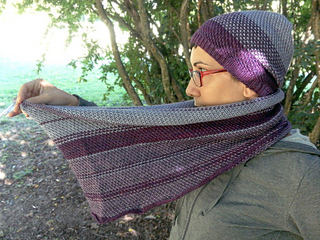 CA: 140 yards/130 m shown in Aubergine; CB: 165 yards/150 m shown in Frosted Mallow; CC: 250 yards/230 m shown in Amethyst. ♡ US4/3.5mm, at least 16”/40cm circular needle or different size to obtain gauge.